A total of £27m has been awarded to Mercia Fund Managers to support businesses across the North East. A subsidiary of Mercia Fund Management based in Henley in Arden, the Venture Fund will be investing in rounds up to £1m, with additional money potentially coming from Mercia’s other funds, and will be targeted at businesses at any stage of their development. The money forms part of the £120m North East Fund, supported by The European Regional Development Fund. 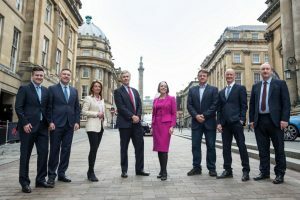 Mercia is also to open a new office in Newcastle, its ninth in the UK, and the fund will be available to SMEs across Durham, Northumberland and Tyne and Wear. The award follows a succession of contract wins for Mercia, worth more than £200m, which includes the recent receipt of a £23m Proof-of-Concept and Early Stage Equity Fund, part of the Midlands Engine Investment Fund, £108m of the British Business Bank’s Northern Powerhouse Investment Fund, the first closing of EV Growth II with initial commitments totalling £45.1m and £11.8m in Enterprise Investment Scheme (EIS) capital. Mercia chief executive Mark Payton said: “The North East has much to offer and we are thrilled to have been awarded this latest fund, which will be an invaluable source of funding for the development of innovative businesses. Andrew Mitchell, chief executive of The North East Fund Ltd, said: “Mercia is one of the leading early-stage investors in the UK.